Make sure your equipment is in good working order. Wear eye protection–not sure if you need an affordable, passive helmet, or a welding helmet with a digital, auto-darkening lens, read the Arc-Zone Guide to Choosing Welding Helmets and Goggles (pdf). you’ll prevent damage to your eyes that could haunt you down the road. If you’re just starting out, or you want to upgrade your welding safety set-up, check out Arc-Zone’s Pro-Gear Package for the PRO Welder. It includes flame-resistant BSX™ welding safety apparel built for performance and safety. The package includes: The Stryker Jacket, the FireRag doo rag, two pairs of matching welding gloves and safety glasses. Using pure (green) tungsten is “old skool”– at Arc-Zone we recommend ArcTime, a hybrid all purpose tungsten electrode that performs really well welding all materials. 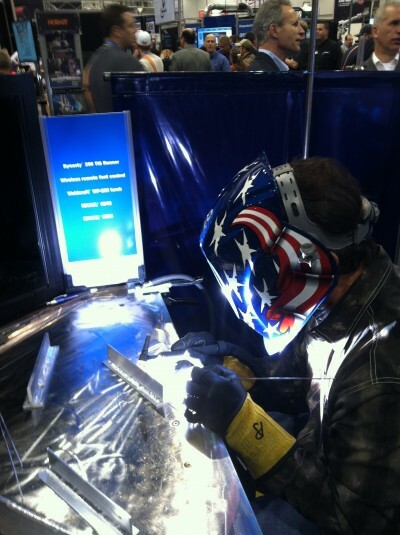 See some more awesome photos from Fabtech 2012 in Las Vegas, NV! I thought your tips for welding aluminum by using a cylinder of 50/50 argon/helium was really interesting. Before reading this, I thought that welding thicker aluminum with a larger electrode would do the trick. It’s good to know that a smaller electrode can get the job done.